An Email Statistics Report done by The Radicati Group, Inc. revealed that over 100 billion emails are sent and received per day, and the majority of that email traffic comes from business email. Out of those billions of emails sent, 70% will not make it to the inbox because of low Sender Scores. Most interestingly, 2% of emails sent from the most reputable email senders will fail to reach their destination. With these astounding stats, it’s no wonder that email marketing remains one of the top techniques to reach a consumer. Now, let’s stop for a moment and think about email marketing and the primary goal of an email marketer. In many cases, it’s getting subscribers to open their email and click on the links in it. If done correctly, marketers should think of all of the different elements that are involved in meeting their end goal. When creating an email, certain components must be included and executed flawlessly to ensure the email gets read. Some of these elements include interesting and relevant content that resonates with subscribers, along with appealing responsive design and a great subject line. But, what if all elements of an email marketing campaign are done perfectly, and the email still never makes its intended destination? This where email reputation comes into play. And Your Sender Score is EVERYTHING! SenderScore’s FAQ page explains how Sender Scores are calculated – on a rolling 30-day average, scores are derived from a proprietary Return Path algorithm that compares performance metrics for a given IP address against metrics important to email providers and the customers who receive emails through those email providers. GET THIS! Based on reputation, even the TOP 1% does not get 100% in-box deliverability rates. Believe it or not, most email sent today is considered to be spam. There’s a lot of illegitimate email flooding the market that never makes it to the inbox. According to the 2014 Sender Score Benchmark Report conducted by Return Path, only 28% of emails delivered worldwide make it to the inbox. For those mailers with sender scores of less than 10, the delivery is only rate is 3%. This means 97% of emails sent get blocked. Wow! Emails will bad reputations can be spotted (and blocked) very easily. This is good news for senders that are reputable, because out of those 72% of emails that fail to make it, the majority are sent from an IP address with Sender Score of 70 (out of 100) or below. Senders who rank below 71 are usually flagged as illegitimate senders due to suspicious send behavior. Yet, senders that have a Sender Score of 71 or higher are still not in the clear. On a college paper, a 75% would give you a C, but a Sender Score of 75 out of 100 would only get you 58% inbox placement. That is an epic fail in email marketing. 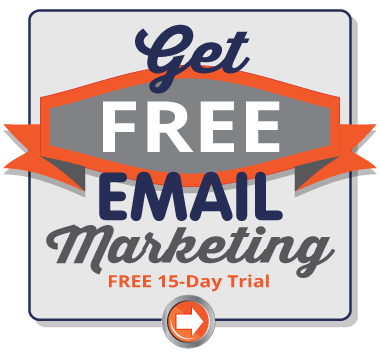 Even legitimate marketers with subscribers that have opted into their email communications can experience low deliverability results if their emails are coming off as spam or they are not updating their lists regularly. 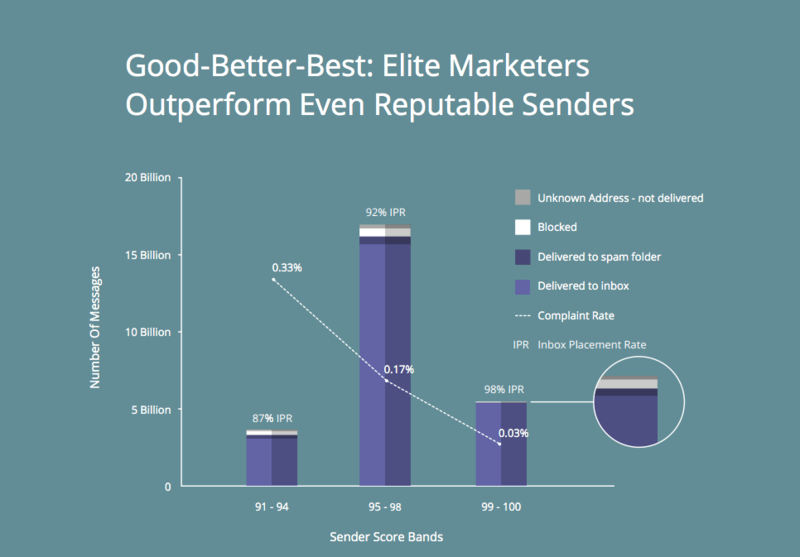 Return Path’s Benchmark determined that more than 20% of messages from senders with scores between 71 and 80 are blocked outright by mailbox providers, and less than 60% get to the inbox. 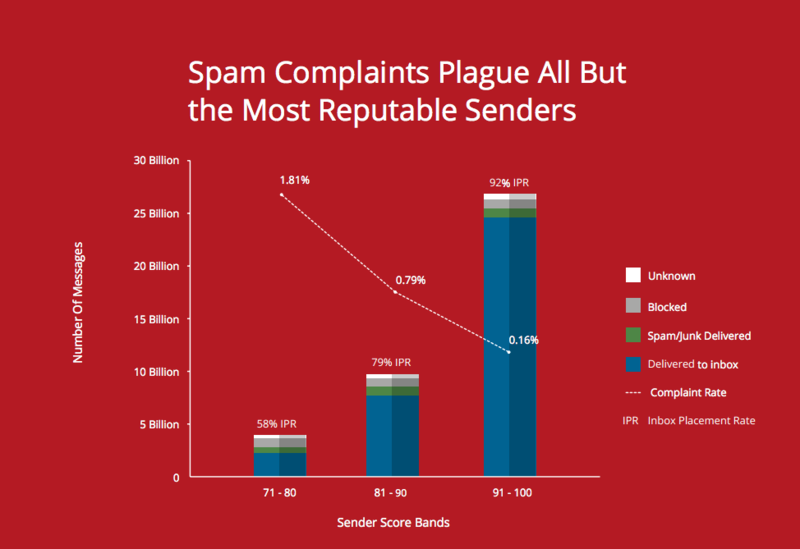 Senders that fall within this Sender Score band also see an average complaint rate of 2%. Complaint levels drop to 0.79% for IPs with a Sender Score from 81-90, and only 80% of messages sent from this tier reach the inbox. These messages are also half as likely to wind up in the spam or junk folder, compared to those from senders in the 71-80 band. Nevertheless, these senders still consistently lose about 21% of messages to the spam folder and blocking. 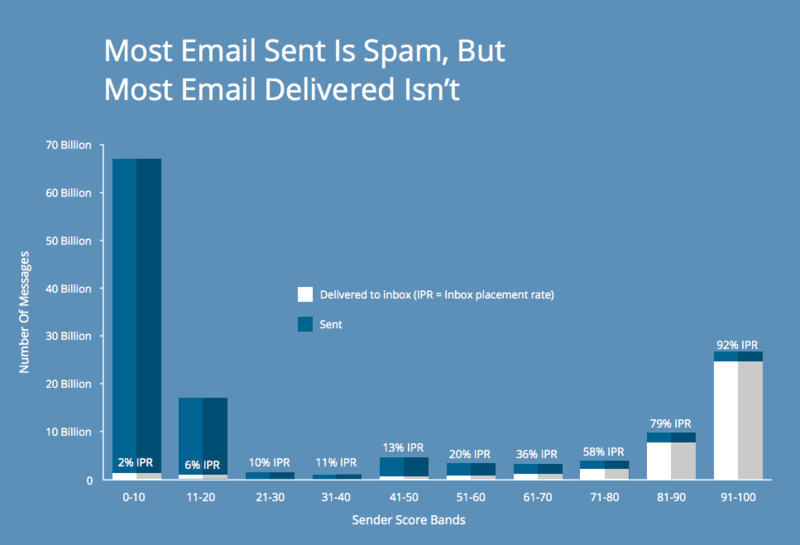 Even those with Sender Scores of 90 fail more than 20% of the time to get mail to the inbox. For those senders who made it to the top tier and score from 91 to 100, inbox deliverability goes up to 90%+, and the spam complaint rating drops to 0.16%, compared to 0.79% in the 81-90 Sender Score band. Only 3% are delivered as spam or junk. The next tier is comprised of those with a Sender Score between 91-100 and includes most of the messages sent from legitimate mailers (66%), and most of all messages delivered globally, regardless of sending reputation (62%). Return Path breaks this tier down by specific scores. IPs with Sender Scores between 91 and 94 exceed global averages; yet, despite the comparatively strong Sender Score, nearly 1 message per seven does not reach the subscriber. 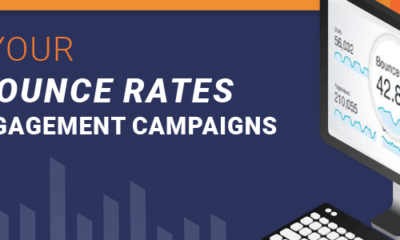 This tier yields a 0.33% complaint rate, which may seen low, but is about 10 times higher that those senders that fit into the best senders’ rates. According to Return Path 2014 Sender Score Benchmark Report, this tier also sends four times more messages to unknown addresses, signaling to mailbox providers that they are not actively practicing healthy list hygiene. Since this flag is sent up, 13% of the emails sent fail to reach a subscriber, and that is despite having a reasonably strong Sender Score. 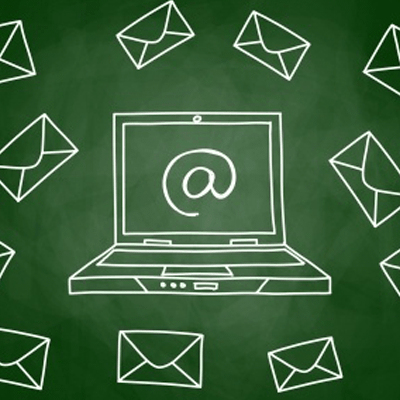 Are you starting to see just how important email deliverability is? These senders make up 40% of all email delivered worldwide. They consistently perform better than those with Sender Scores between 91-94, yet still yield complaint rates 5 times higher that what Return Path refers to as the “the-best-of-the-best” – mailers from IPs that maintain Sender Scores of 99 or 100. Placed just behind the “the-best-of-the-best,” this bracket of senders has a 92% deliverability rating. To put that into perspective, a score of 98% is a near perfect on a college test, yet as a Sender Score, it only earns 92% inbox placement – 8% of your emails are still being blocked. Deliverability is good, but still not close to perfect. Sitting at the top are those who have a Sender Score of 99 or 100. These senders account for 14% of all email delivered worldwide. Notably, only 3 out of 10,000 of email messages sent from the-best-of-the-best generate a spam complaint and less than 1% of their messages are sent to junk mail folders or are flagged as spam. What is important to note here is that even senders that have an impeccable reputation and rate with a Sender Score in the top tier of 99-100, still do not have a 100% inbox placement percentage. 2% of their emails will still not get delivered. As an email marketer is it essential to understand how important your send reputation is. 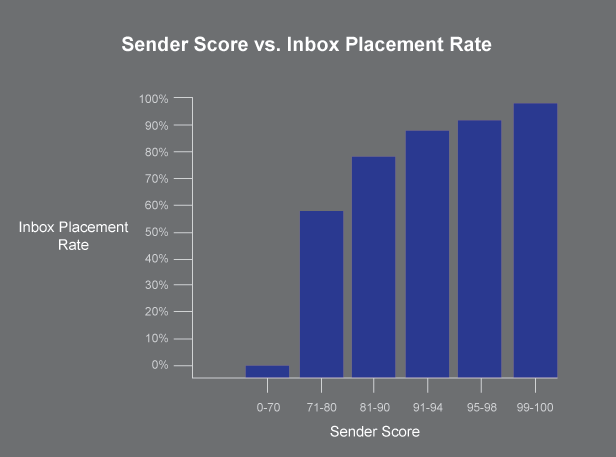 In the graph below you can see how Sender Scores effect inbox placement. Your reputation should be top of mind with any email campaign you send. So now you may be wondering your Sender Score fits in when you send marketing emails from an Email Service Provider (ESP) like Pinpointe, which manage the IP addresses your email campaigns are sent from. Many ESPs optimize their infrastructure so the campaigns their customers send out reach the inbox. Most utilize a multitude of IP addresses for their customer base and set a daily limit on how many emails can be sent out from each specific IP address. To maintain a high Sender Score, most, if not all, ESPs have a strict rule about sending only to opt-in email addresses. 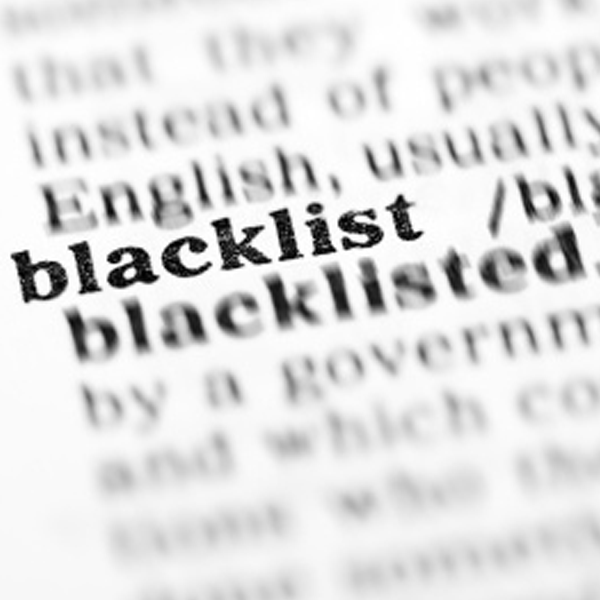 If their customers do not comply, it can greatly impact their Sender Score. Therefore they will cancel your account without hesitation. The bottom line is, as an email marketer, YOU need to make sure your sender reputation is solid and your email campaigns are not being flagged as illegitimate. Even if your ESP has a good Sender Score, the inbox deliverability rating of your emails will still drop if your email campaigns are sending off red flags that include: spam complaints, sending emails to unknown addresses, questionable content, etc. For an example, you cannot send to a list of contacts you haven’t reached out to in over 6 months and expect a high deliverability rating. Just like in life, your reputation is determined by a number of variables. Keep it clean and honest and you're reputation will precede you. Sender reputations that rate the best often produce a very low number of spam complaints and are maintained by senders that understand how subscribers interact and respond to messaging. Some marketers are able maintain a great send reputation, which inspires brand loyalty with each email campaign they send, while others regularly fall short and fail to make it to the inbox. It's important to know where you fall and make sure you set your deliverability expectations accordingly. Pinpointe is a Return Path Sender Score Certified. try Pinpointe for free for 15 days.